TAIPEI–Taiwanese researchers have identified one possible reason that practitioners of the Martial Art Tai Chi tout its health benefits: shadow boxing apparently reinvigorates stem cells. In a study published in the international medical journal Cell Transplantation, a research team found that Tai Chi can increase the number of stem cells in practitioners. Lin Hsin-jung, a neural surgeon and head of China Medical University Beigang Hospital in southern Taiwan, said Saturday that his team’s research has been selected as the cover story for the latest issue of the journal. He noted that the public has long considered Tai Chi to be good for the body, and practitioners say it helps them live a longer, healthier life. Lin and a team of researchers put the theory to the test with three years of research. In the study, 60 subjects were divided into three groups, two of which undertook Tai Chi and speed walking, respectively, and a control group that did no exercise at all. The researchers concluded that the Tai Chi practitioners saw their individual stem cell counts increase by increments of three to five times. 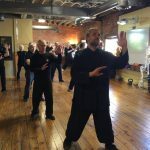 Regular Tai Chi exercises helped the subjects with heart function, reinvigorated neural cells in the brain, balanced excitement and inhibition controls, and helped with mental trauma and nerve exhaustion, Lin said.